Their products have nothing artificial; no colorant or preservatives. I started off trying the coconut milk honey and oatmeal soap. It has a smooth lather that I love. The scent is very mild, so if you don't like strong smells this is a great choice. It has enough lather that I used it to shave my legs, and it did an excellent job. Afterwards, I tried the Island Lime dry skin balm. It smells wonderful - just like key lime pie. In fact, after I used it, I had to go bake some key lime bars, just so I wouldn't eat the skin balm. It does a great job on extremely dry patches of skin, and I found it very soothing. I also tried the lemon meringue lip balm, which is organic and also has a delicious scent. Because it doesn't have any harmful ingredients, I let the boys try it too, and they loved the taste. Also of note is their joint balm, which I didn't review this time, but it is a product I use regularly for sore muscles, and I ordered some previously for both my dad and my grandmother to help their arthritis. If you are looking for organic, chemical free bath products, I have found these to be very high quality and nourishing. They have speedy shipping, and are very consumer-friendly. I've also found their soaps make wonderful gifts! Eco Natural Soaps has offered a coupon code to readers: TBF1548 It is good for 15% off on any order of $10.00 or more and is good on any of their products - even the ones on sale! Also they always have free shipping! The coupon code is good through 4-8-2014. Readers, what scent of soap would you like to try? Disclaimer: I received these products for review purposes. The opinions above are my own. The lemon meringue lip balm sounds "delicious"! These sounds wonderful! I love that these products are safe for kids. I use body wash--I love the Bath & Body Works varieties, especially vanilla and coconut. I think I just like to smell like dessert! These products sound great. My dishwasher crashed during the coldest part of the winter, which reduced me to handwashing dishes and then taking Fergus out for a walk, leaving me with crater-type chapped hands. I need a good skin balm. These products sound wonferful. I like natural ingredients in every kind of products, especially for our body. It must be safe and eco friendly. I would probably like the lip balm. The products sound very nice and of good quality. However, I'm allergic to fragrances. These sound delicious smelling! I bet the lemon balm smells especially good. 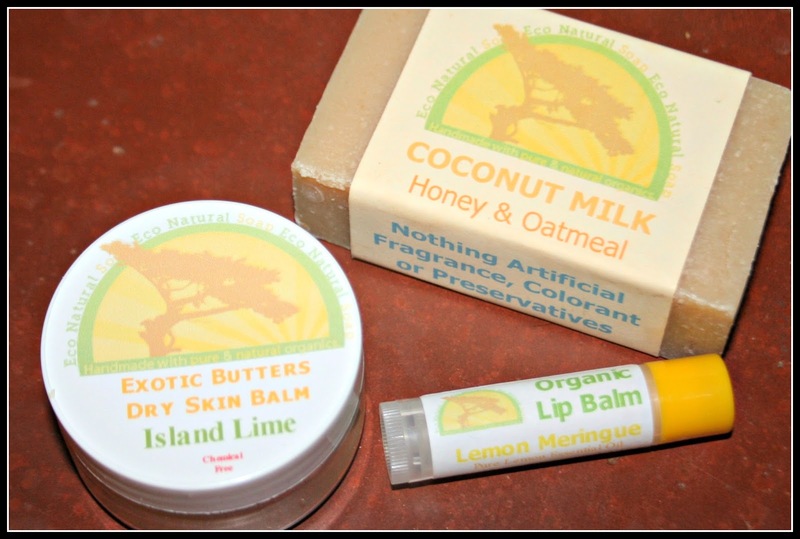 I have some mango butter Burt's Bees Balm that I really like. We use a natural soap from Marseille, one soap that has been manufactured for decades, my favourite and very kind to my aging skin. My skin is crazy dry. I'm still using body butters, the thicker the better. At summer I usually use something light. I stopped using soaps in solid form, I find liquids and gels handier in the shower. I try to use eco as much as possible as well. Nice. My skin is also very dry and yucky. That coconut honey soap sounds divine! The less chemicals we use in our products and have in our foods, the better off we'll all be. I've never heard of lemon lip balm. I think that would be my favorite! I think your soaps would smell soooo good! Those are all for women, neh? Guess I better stick to Irish Spring but I'll get my wife to look and see if she would like some feminine soap. Thank you, I love natural soaps and I will check them out right now! Lisa: You can only imagine the skin hydration challenges of living in Phoenix. My dermatologist has me using a product twice a day. Good information here! Anything with coconut smells so good to me.